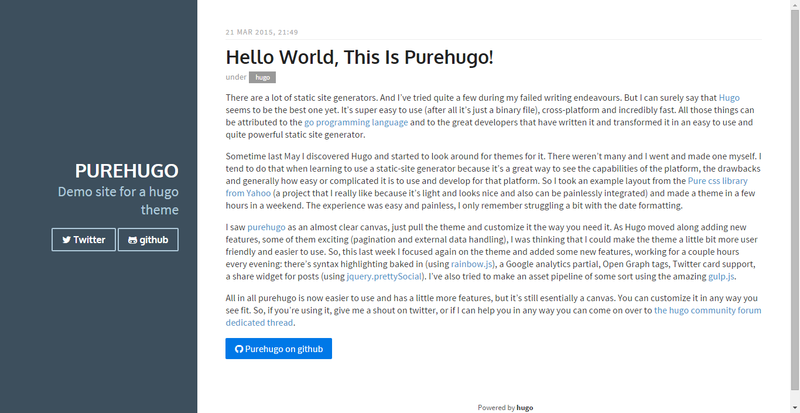 Hugo theme based on purecss from Yahoo. The theme is based on the purecss blog layout example, is responsive and has a few more features: pagination (if enabled), responsive images (through a shortcode), google analytics, disqus comments and even a mini-asset-pipeline using gulp. If you end up using it, I’d love to see what you do with it so please give me a shout on twitter. description = "Demo site for a hugo theme"
Notice the configuration necessary for disqus comments (just setting the disqusShortname); the twitter, github, stack overflow and linkedin handlers (for the site sidebar); the site description and enabling Google Analytics reporting. Syntax highlighting is enabled by default and it uses the nice rainbow js library. All you need to do is to let rainbow.js the language of the highlighted code, using something like ```go when writing the code in markdown. If you would like to hide the share options in the single post view, you can add this option in the params section of your config file. If you would like to hide the text next to the icons on the sidebar, you can add this option in the params section of your config file.